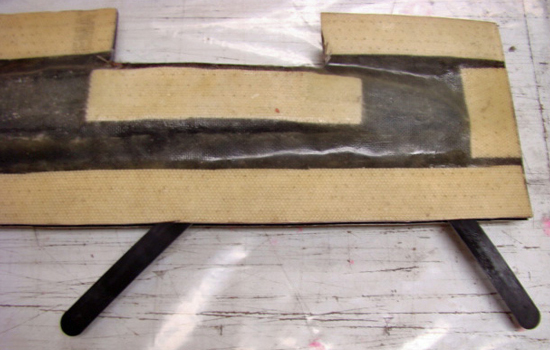 How To Make A Fiberglass Mold Instructions - CST The Composites Store, Inc.
To make the mold for the fuselage hatch, apply a tooling coat layer of epoxy to the pattern in the area where the hatch will be located. 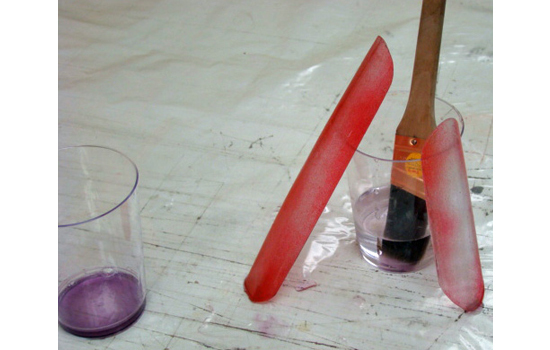 Tooling coat is made by mixing a batch of West Systems 105/205 Epoxy add a teaspoon of graphite powder to the mixture then stir in 406 filler to thicken the mixture to the viscosity of ketchup. Make the mold a little larger than the intended hatch size. Allow the tooling coat to cure to a soft solid; this should take about 30 minutes. 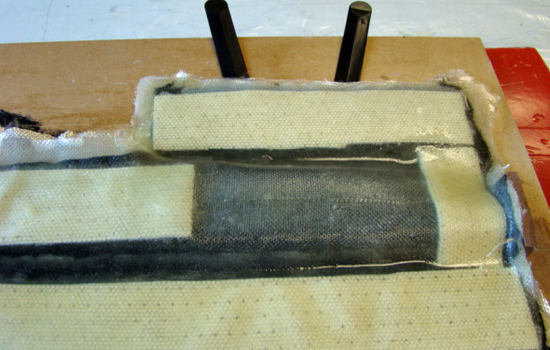 Apply two layers of fiberglass cloth and epoxy over the tooling coat layer. On this small mold for the hatch, this lay up should be sufficiently strong. 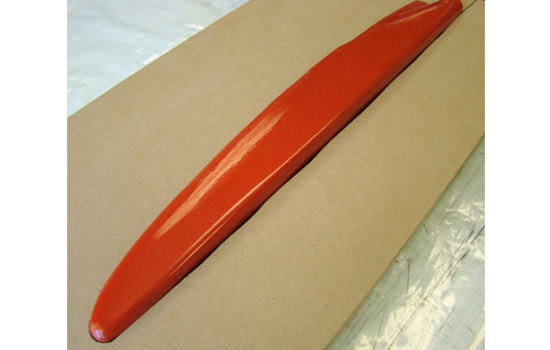 The fuselage will be molded in two halfs then joined. 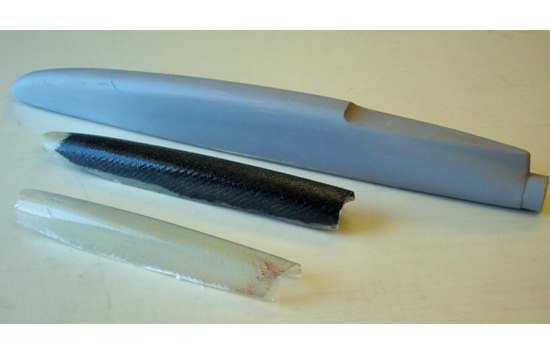 If you have a complex fuselage shape you may need to divide it up into more parts. In order to remove the finished part from the mold, there must be a positive relief angle on all the mold parts. 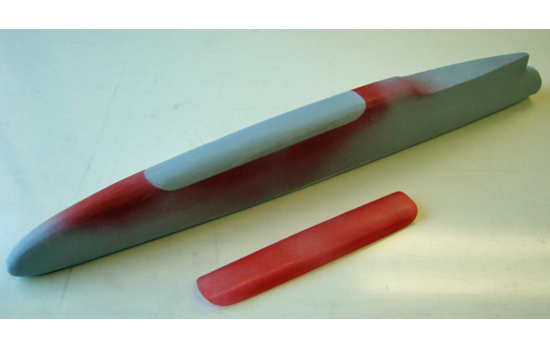 This means that the mold cross section must get wider as you go from the deepest part of the mold to the outer edges. 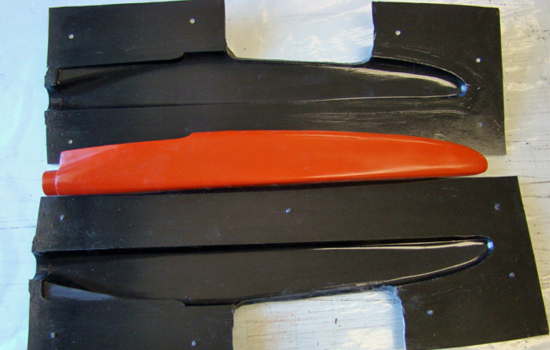 The parting surface of the mold defines how the multiple parts of the mold will fit together. 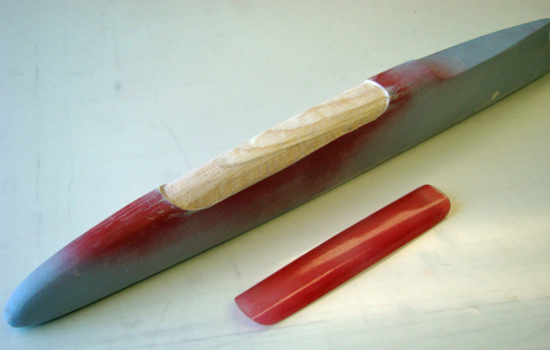 The parting surface is made from a sheet of ½” MDF with the profile of the fuselage cut from the center of the sheet. 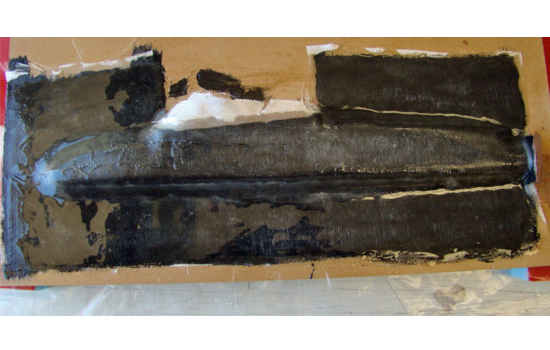 The small opening around the edges of the fuselage pattern must be sealed. This can be done by first mold releasing the pattern. 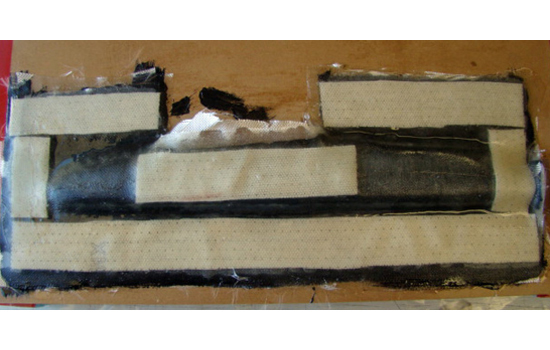 Then place the fuselage pattern into the parting surface with half the pattern exposed. Fill the opening around the edge with a mixture of West Systems Epoxy and 406 filler. 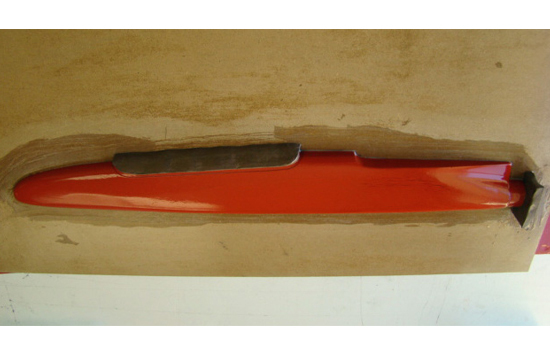 After the epoxy has cured remove the pattern from the parting surface and block sand the parting surface flat along the edges. After you have the edge gaps filled build up the areas where openings in the mold are needed with clay. These openings give you access to the inside of the mold so you can join the half's of the molded part together. I have built up the areas of the hatch opening and tail boom connection opening. 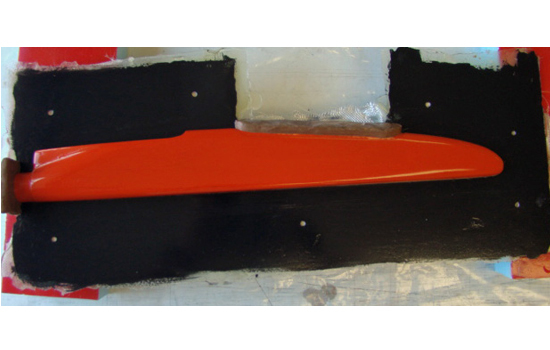 It is important to apply both Partall mold release wax and Coverall liquid mold release to the fuselage pattern and the parting surface as you did in step 1. Let the layers set up for about 30 minutes just as you did with the tooling coat layer. 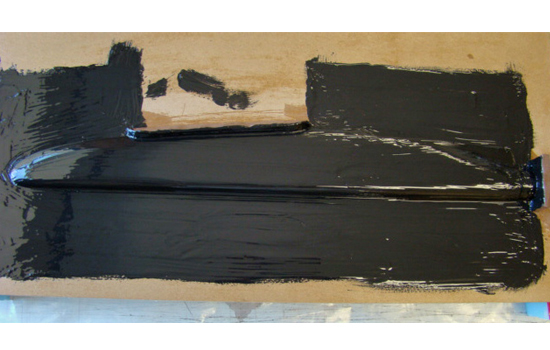 The curing time between layers is not critical. It must be long enough for the epoxy to set and be only slightly tacky as a minimum and short enough that the epoxy is not completely cured. At a 70° room temperature, anything between 30 minutes and 4 hours will work for the West Systems 105/205 mixture we are using. When completely cured.Use a Dremel toll with a reinforced cut off wheel to trim away all the rough edges on the molds. Carefully separate the mold halves, you may need to use a model knife into one corner working the blade between the molds and gently twisting. 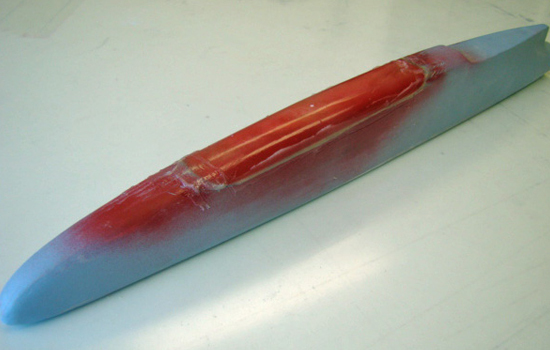 When a crack appears, slip a wedge (a mixing stick works great) into the space and run it around the mold to separate the halves.